'Game of Thrones' table read for the final season was pretty emotional for the cast. Could this be the reason? 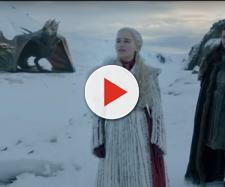 "Game of Thrones" Season 8 was pretty much spoiled a couple of weeks ago when "HBO" Senior Vice President of Drama Francesca Orsi talked about the table read for the final episode We all know that there were tears involved and a 15-minutes standing ovation after the final script, but it was what she said before that could be considered a huge spoiler. "None of the cast had received the script prior, and one by one they started to fall down to their deaths," Orsi said about the table read. This might not be a big surprise since this is the final season and many characters will certainly die, but still, this is a shocking thing to say given how hard "HBO" is trying to keep everything related to "Game of Thrones" Season 8 a secret. And while it's certainly possible that they are just keeping the hype going during the offseason, according to today's theory, a lot of main characters might just as well die. Bear with me, and you will find out a surprising reason why. A huge shout-out to Kevin from YouTube channel "bridge4" for putting pieces together and creating this thought-provoking theory. I strongly recommend watching his video at the end of the article for all the details. Now, let's see what the theory is all about. To better understand this theory and how it relates to "Game of Thrones" Season 8, we must go all the way back to the Age of Heroes. Now, if there is anything we know about this period, it's that it was the age of wonder, with men who lived hundreds, even thousands of years. Take Lann the Clever, for example, the founder of House Lannister who supposedly lived to the age of three hundred and twelve, or Durran Godsgrief, the first Storm King who ruled for a thousand years. Not to mention Brandon the Builder, the founder of House Stark, whose magical constructions include places like the Wall, Winterfell Crypts, and Storm's End. With all of this in mind, the question remains: How did they manage to live that long? Maesters would tell you that these legends describe the reigns of multiple kings that have been remembered as one through the passage of time. But according to "bridge4," these people actually lived that long through the extensive use of blood magic. They would sacrifice people in front of the Weirwood Trees (just as one of the last Bran' visions from the books tells us) to keep themselves alive through blood magic. In other words, First Men were abusing the magic of the Children of the Forest and, according to this theory, this is exactly what caused the first Long Night. Despite the fact that they were the ones who created the White Walkers in the first place, the Children of the Forest made another Pact with humans. They would help men end the White Walker invasion, and men would stop with the blood sacrifice. And so they did. Then, the Wall was built and the Night's Watch established. Now, let's talk about their vows, or rather the two lines, relevant to this theory. "I am the watcher on the walls. I am the shield that guards the realms of men." According to this theory, this part of the Night's Watch vows isn't about the actual Wall that separates two territories and keeps the realms safe from the wildlings or the White Walkers for that matter. Instead, it's about "the wall of death" meaning that whoever dies should stay dead and that they shouldn't keep themselves alive unnaturally through the blood sacrifice of either fire or ice (Wierwood) magic. There's some textual evidence that supports this claim as in the "A Song of Ice and Fire" books, both Maester Aemon and Jon Snow talked about this spiritual wall between life and death. "Who has been beyond the wall of death to see?" Maester Aemon wonders. And in one of his many dreams about the Crypts of Winterfell, Jon Snow states: "Sometimes I hear Robb's voice, and my father's, as if they were at a feast. But's there's a wall between us, and I know that no place has been set for me." Fast forward to the present timeline, and we now have the modern death cheaters in the form of Jon Snow, Beric Dondarrion, the Mountain, Melisandre, and even Daenerys Targaryen. They are all alive thanks to the blood magic, the only magic that counts. Because, after all, only death can pay for life. The death of Shireen paid for Jon Snow's life, Melisandre's constant sacrifices are paying for her prolonged life, and according to George R. R. Martin, the death of Mirri Maz Duur (and also the deaths of Khals in "Game of Thrones" Season 6 Episode 4) paid for Daenerys' life, and so on. In short, all of them have used blood magic to cheat death, to break the Night's Watch vows. So in conclusion, we can expect all of these characters to die before "Game of Thrones" Season 8 ends. In my opinion, that's the only way, because only the death of blood magic can pay for the life of the whole mankind. What do you think about this theory? Let me know in the comments. And don't forget to watch "bridge4" video for all the details.